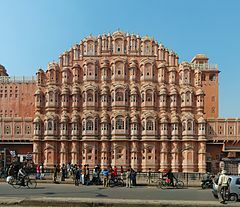 Hawa Mahal (English translation: "Palace of Winds" or "Palace of the Breeze") is a palace in Jaipur, India, so named because it was essentially a high screen wall built so the women of the royal household could observe street festivals while unseen from the outside. Constructed of red and pink sandstone, the palace sits on the edge of the City Palace, and extends to the zenana, or women's chambers. This article uses material from the Wikipedia article "Palace of the Winds", which is released under the Creative Commons Attribution-Share-Alike 3.0 License.